In 1967 Israel did not wake up one morning and decide to go to war - she woke up one morning and found she had to defend herself. 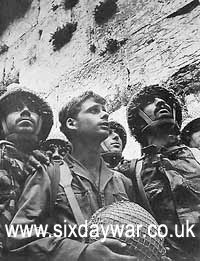 2007 marks the fortieth anniversary of the war the West terms "The Six Day War". The Arabs call it the "1967 War" or an-Naksah (The Setback). It has been said that for Israel this war was a question of sheer survival; for the Arabs it was one of credibility. Of course hindsight is a wonderful thing, offering immense clarity over what could or should have been done. It is too easy to be judgmental in retrospect. So this site has tried to turn back the clock to give you a flavour of what it was like to be in Israel at the time, living with the tensions involved with a countdown to what Israel's opponents suggested would be anihhilation. This site has gathered background information from a wide variety of sources to give a deeper understanding of how circumstances developed over the weeks and months leading up to the war. The war itself has been comprehensively documented, both in books and on the internet, so this site will concentrate more on the build-up and the aftermath.